Chillin’ with Andy Bey, originally uploaded by in2jazz. Bonnie, me, and Andy! I have been saving this photo to share for a special occasion. I think my birthday is special enough. This photo was taken backstage in April when Andy Bey played Yoshi’s. 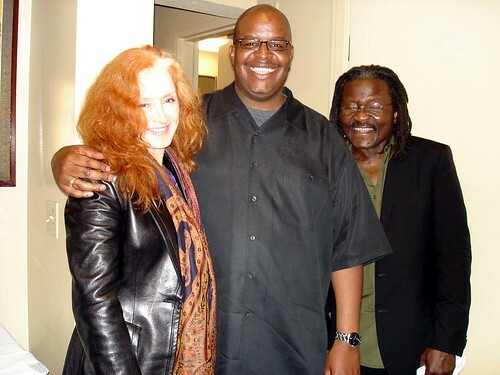 Yes, that is Bonnie Raitt on my right and Andy Bey on my left. It was definitely have a special moments that I will remember always. The year has been filled with special moments and great music. After a short vacation, I will be turning all the notes that I have been taking into music reviews. As always, thank you very much for visiting my site and please keep coming back. Tonight, I am going to see Andy Bey and Paula West at the Herbst Theatre. They are closing the SFJAZZ Festival Spring Season. I am sure it will be a great show. This entry was posted on Sunday, June 26th, 2005 at 9:24 am. It is filed under Special Feature. You can follow any responses to this entry through the RSS 2.0 feed. Happy birthday and many more!!! Have a very jazzy birthday! Here’s a second HAPPY BIRTHDAY to you Big Daddy. So when are you coming back to the east coast? Thank you very much! I promise to get back that way soon! Happy belated birthday, James! I hope you had a great one. Awesome photo, too.